Help allies and haunt enemies when your Soul Sacrifice avatar leaves its mortal coil. The upcoming Vita exclusive Soul Sacrifice is gaining attention for its dark art aesthetic, an ally-murdering co-op mode, and the Japanese-exclusive Vita bundle. The game's release is just months away, but certain questions remain about how death and sacrifice will function in the game's co-op mode. If you sacrifice yourself to save the team (or are stabbed in the back by a fellow player), does that mean your character is completely lost? 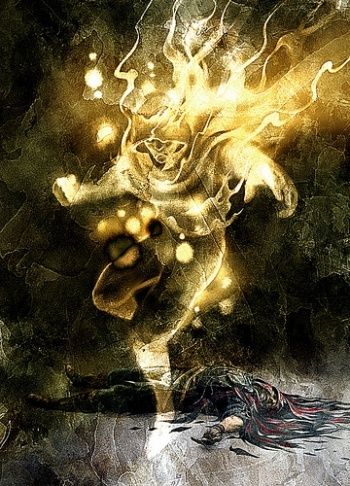 Creator Keiji Inafune has given a partial answer by revealing Soul Sacrifice's Ghost Mode, in which dead characters maintain the ability to interact with the living. Suppose you're in a co-op battle with friends and a monster separates your head from the rest of you. Where some co-op games force you to watch helplessly while your teammates finish the fight, Ghost Mode allows the deceased to directly influence their efforts. Ghost players are provided with the current status of allies and enemies, and can interact with them using the Vita's touchscreen. Abilities include strengthening teammates, weakening enemies, and other actions appropriate for a helpful guardian spirit. It's unclear how exactly Ghost Mode will be integrated with the Vita's touchscreen, but the premise has potential. A frustrating death in multiplayer usually prompts anger and a rage quit, but Ghost Mode could allow fallen players to remain engaged in the battle at hand. Or perhaps it will lead to ghost players wandering the map, haunting and trolling hapless adventurers. We'll find out when Soul Sacrifice launches early next year.